When you set off on a journey, you never know where it will end; but, when you set out to do something good, you are aided from above, guided through the myriad of obstacles lying in your path. And so it was. Obviously, the term “Mashgiach of the Year” could not mean that that particular year was his best year ever, but it would be the year that we discovered how good he is at what he does. We decided the best way to find our man would be to enlist the help of our 1,000 plus kosher agencies across the world. Send us your best men. Recommend them for the award and we will choose from among them. A nice sample of the agencies responded with their recommendations. We limited them to two mashgichim maximum to be nominated for the award. Many chose to go with one only, their best. And they sent us reasons why they recommended this mashgiach from among their entire staff. Soon we had a healthy pile to choose from. But what would be the criterion? We knew that we weren’t looking for a man who had dived into a hot chicken soup to recover a lady’s lost ring, but what did we want to find in the mashgiach? We decided on normal criteria (list above), what everyone knows makes a good mashgiach. Then the process began. We would have to call the men whom seemed to fit our criteria. We talked and we talked. One of those we called refused to talk to us about anything happening at his workplace until he got clearance form his rabbinic supervisor, which he did. It was plenty of work, but I wanted to do it myself. (Maybe next year I’ll hire a crew to do it — a big crew.) And I learned a lot about the mashgichim we have out there, especially those recommended by their kashrus agencies. They are good, really good. The dedication I saw from these men is truly laudable, and the appreciation which they have from their agencies is powerful. Some agencies sent pictures of the mashgichim. Some sent me the advice they had received from the mashgichim. Some companies started contacting us about mashgichim who work at their facilities. It was a startling revelation about how necessary these men are in the production of kosher food. Gedalya’s father, Rabbi Shraga Silverstein, had been a prolific translator of seforim including Rashi on the Chumash. Gedalya married the former Tzivia Berkowitz, and together they have raised three children: one boy and two girls. We interviewed Gedalya Silverstein from his home and from his workplace at Goodfriend. KASHRUS What are your responsibilities at your present job, Goodfriend catering? G.S. At my former position, the Kroger supermarket, my job required me to work in the meat department and to watch that deliveries were handled properly. But, this position requires much more awareness. At any given time, I can have anywhere from one to fifteen employees of Goodfriend to oversee in their preparation of the food. KASHRUS What are your goals at Goodfriend? G.S. Obviously my main goal is to maintain hashgacha, but I also have to help my boss with his goal for me, to present a good image for the company. And, the “AKC” has placed another goal for me to attempt to reach: to maintain “AKC” policy. So, I sometimes feel I am being pulled in many different directions. KASHRUS What’s the difference between “AKC” policy and “maintaining kashrus”? G.S. A kashrus agency has to insure that kosher is preserved. To that end, they will establish policy to protect kosher standards. But, their policies are not always helpful in maintaining the kosher standards that they are meant to protect. For many mashgichim and in many situations, these policies may be helpful, but not to all scenarios. The mashgiach on the job is like a rav. He has to decide the halacha or the way to proceed on the spot. In some cases, he sometimes has to make an on the spot decision and needs to know how his kashrus agency would want him to deal with a problem that may require bending the policy in order to preserve the halacha at that moment. When there is time, a call should be made to a rav, but there is not always that time, and you don’t always catch the rabbi on the first try. That’s why you are there. Your kashrus agency chose you because they think that you can do it. But when you are all alone, and pressure builds up, you have to make that judgment call. KASHRUS Can you give us examples of when you’ve had to make those judgment calls? G.S. The “AKC” has a policy, a good one — aprons must be changed immediately when a worker goes from one kitchen to another (meat to dairy or visa versa). It’s a good policy and one to strive for. But, I know the place where I work. If I would try to enforce such a policy, I would have a revolution on my hands. Instead, I watch everyone’s hands. By seeing their hands, I can control kashrus at our facility. If I don’t see their hands, I can’t control kashrus; changing aprons is not enough of a safeguard. What the workers are carrying, what they are working on and what they touch, those are the issues for me and if I must watch ten people at once, I want to be certain that I do not miss a trick (running after a worker to change his apron and letting two others free to roam about). KASHRUS Rabbi Stein told us that you are always working. What did he mean? G.S. This is another of my ideas about kosher. How much should a mashgiach be involved. I think that he must be constantly working and involved in everything happening in the kitchen. I could probably arrange my job so that I would just need to watch what goes on and many mashgichim do just that. But, that way I will never know what is happening in the kitchen. Anyone could pull the wool over my eyes. If you are serious about knowing what is happening, you have to be in it. It keeps you alert. It is appreciated by everyone. And, the staff see you as part of them, not as an outsider. Lastly, and this is a big one, only then can you discover things that you otherwise would not. I bake. I wash the dishes sometimes. Why, because that is how I discover whether the staff is mixing up dishes. Naturally, if the place is filled with workers, I can’t jump into an activity in only one part of the facility or I would lose control. But, when I can work together with them, I do. KASHRUS You mentioned possible mix-ups. How do you prevent them? Do you use paint or do you use stickers to show which utensils are dairy and which are meat? G.S. I use neither. I engrave. You see, when I came to the facility, I had no way to fully identify all of the dishes and utensils. Some of the utensils and vessels were marked in a manner which I feared would not be permanent and others were no longer marked at all. I also was unsure that they were all toveled. So what did I do? I took all the dishes out to be toveled. Then, while they were out, I marked them clearly with an engraver. Engraving is not going to get washed off. I was careful to do it without making a fuss, and no one is even aware that I did do it. The markings are inconspicuous, but they are really clear and will never get erased. And, I will know what is what. KASHRUS How do you view your role in kosher supervision? In other words, what is the mashgiach’s function? G.S. It takes a lot to make a good mashgiach, a good deal which people do not realize. I think that short term memory loss is a good thing to have when you do hashgacha. You’ll need to always check again. That kind of conscientiousness is a sine qua non. Seriously, though, a mashgiach makes his own job. If he makes it a nice place to work, he will feel good about himself and the workers will feel good being around him. Remember, one worker, if he is upset, can treif up an entire kitchen without anyone catching him. And, brought to do it, he will. No-one can watch him all day. If you make the workplace a nice place to be, where there is no tension, then workers cooperation with the kosher program is assured. KASHRUS In what way are you sometimes called upon to lay down the law with an owner or manager and with the workers? G.S. There is an approach-avoidance challenge here. If you issue a “rein of terror,” the boss won’t love you nor will his workers, and trouble lies down the road for you personally or for kashrus. On the other hand, the buck stops with you. You are not only the eyes and the ears of the kashrus agency, you are also in some ways a policeman. The rabbi is not there during production, you are. The mashgiach must understand that when bottom line kashrus issues surface, such as bishul akum, you need to quickly get to your rabbi. I work in a facility that is predominantly filled with workers of Mexican origin. One worker will ask another about a kosher procedure. One lady is their “posekes” who is always “deciding” halacha for them. In fact everyone in our kitchen claims to know kashrus better than me. They even quote precedents to me, times they had worked in a kosher setting in a Reform synagogue and that this is how it was done. They are sure. I suppose that I am fortunate to be working with some of the great kashrus experts of all time. They know kashrus; I don’t. I will have to say at some point, “Despite what you think, this is how it is going to be done.” My job is to point things out before we get to the “pressure point,” and to avoid calling Rabbi Stein, which may mean that all production will stop. I must avoid conflict at all costs. KASHRUS What would you recommend to other mashgichim who are entering the kashrus field. G.S. 1. If you are not happy with your position, don’t do it. If you resent the environment you are working in, then get out, kashrus is not for you. 2. Make certain to get an answer immediately from your rav for a question that comes up, otherwise it will linger or snowball and make you all grey. 3. No one is “appointed” as a mashgiach, you make yourself into one. If you walk in to a facility and you are not willing to make the changes needed for kosher, if it is too much pain for you or you do not have the skills, you won’t be a mashgiach. Oh, you may have the job, but you are not a mashgiach. But if you can take control hopefully with little or no conflict, then you are a mashgiach. A mashgiach needs to realize that fear will backfire. Make it as easy as possible to cooperate with you and the kosher program, and then you will have kosher, good kosher. Ironically, my job is not to trust, but it really works the other way: the more I trust and the workers feel it, the more they want to live up to my expectations. What’s needed is more education for the mashgiach, training before he comes into a situation: what to look for, how to make the kashrus agencies policies work for kosher and how to handle rough situations. I was lucky. I had a decent background in halacha before I went into kashrus and I just kept asking questions. Main Menu: Established 2010. Manufacturers of frozen ground chicken/turkey loaves, and side dishes made of farm fresh poultry/vegetables and wholesome ingredients. For nutritious meals in minutes. Paskesz Candy is the leader and innovator in kosher candy and confections. Paskesz buyers shop worldwide and strive to expand its vision for the kosher consumer. More than a candy company, Paskesz has branched out to add high quality grocery items to their repertoire, such as melba toast, corn cakes, rice cakes, and soon to arrive breadsticks. There are always many new and exciting ideas on the drawing board. Paskesz products are all made under the strictest kosher guidelines. "THE GREATEST NOSHES COME FROM PASKESZ"
Chai Ko Tapas Fusion Steakhouse and Sushi, “RCBC”-certified, is the new fusion Steakhouse in Teaneck, NJ. Your hosts Yamin and Ofira, owners of Estihana. For all your catering needs call 201-530-5665; www.chaikotapas.com. KosherVitamins.com is the largest online Kosher Vitamins Superstore. It provides a huge selection of thousands of Kosher Name Brand Vitamins at discounted prices. KosherVitamins.com is dedicated to helping the kosher consumer to fulfill their health and wellness needs. The KosherVitamins.com website also provides Healthnotes, which includes free access to vital information about key health concerns and products. Their Nutritionists are available and waiting to assist customers through instant chat, or by phone, 1-800-645-1899 creating a most satisfying and customer friendly enjoyable shopping experience. Koshervitamins.com ships worldwide and looks forward to assisting all its customers to enjoy healthy living! I never got around to writing in just what mitzvah I would like to do in his memory. In fact, I don’t plan to write anything on the card; yet, except on Shabbos, wherever I go, the card is in my pocket. I never met Leiby Kletzky. I do not know his family, although I did learn that his father had been a mashgiach at the Empire plant. I had planned to help in the search, but it had ended before I could go. The night of the funeral, I had gone to Williamsburg to attend a wedding and later to give my regular shiur. I guess I am like most people. I was horrified at the time. I couldn’t stop talking about it. Then, life went on. But, I still carry Leiby’s card. There is a man sitting next to me in davening. His tefilin seem to be on wrong. They are too low on his brow, not straight on his head, or they are not on the muscle of his arm. I think, “Maybe he’ll realize it himself. Maybe they were put on correctly when he started davening. Maybe he’ll get upset with me.” Then I think about the card, and I take the plunge. Most times he is pleasantly interested in having me fix his tefilin for him. Sometimes, I even end up blackening them for him or sending him to a Hebrew book store to have them repaired (new straps, square off the corners, etc.). There are truly endless number of acts of chesed which we can perform, one Jew helping another just because we care. I remember one time I was “out-of-town” for Shabbos. Friday night I was sitting behind two boys (12 or 13 year olds) in shul. They could not stop talking. They even spoke during the blessings before and after the shema. When I finished davening, I asked myself, “Do I say something? They will only think me a ‘rabbi’ and dismiss what I have to say. They don’t seemed troubled by their talking at this time in the prayers. Better not.” But, then I told myself, “You are only here this one Shabbos. If you don’t say anything to them, most probably no one ever will.” So, I chanced it. Amazingly, they were receptive and apologetic. They had not realized that you cannot talk at that point in the davening. I was extremely elated to greet those who were to go on one of our recent trips, because the summer training tours at Pos’tiv included many who had waited since December to come. They needed a time that would not take them away from work, school, or learning. Late in the day, one of the group, speaking to me by cell phone, bemoaned the fact that he had not been truly aware of the issue of insect infestation until he came on the tour. He felt that he had “failed” as a mashgiach until now. What follows is an interesting story which the head mashgiach of Pos’tiv related to me recently. I share it, hoping that the message will reach its mark. “I responded, ‘Yes, definitely!,’ but, in my heart, I prepared myself for the unexpected. “‘Then I’ll tell you,’ he began. ‘I have to always be very careful when somebody comes to the plant for a visit and he is considered by many as an ‘expert in checking for insects’ because I don’t want to insult the man. At the same time, I don't want him to walk away with an inaccurate confidence in his ability, if he is really fooling himself. “‘So, the first thing that I do is to ask him which insects he is familiar with. Actually I ask him which insects he knows well enough to identify them and to discover them on the various vegetables. There are so many hundreds of sizes and types of insects that I have to start somewhere, on some common ground, before we compare notes. “‘If he is able to name and to properly identify an insect, I move on to a more advanced level, but, if he says ‘I have a very good, sharp “detective” eye, but don't know the exact name of the insect,’ this becomes a red flag for me. Frankly, I was surprised. I had thought that mashgichim would value an eagle eye over everything else a mashgiach needs to have. But, it seems that Pos’tiv has trained them right. Number one must always be an honest grasp of what you do know and what you do not know. Over these last nine months since we have been running tours of Pos’tiv and a full day of vegetable inspection training, what I have learned clearly is that those who are already mashgichim and come to Pos’tiv walk away with the most from their day of training. But, even more important, I am struck by their honesty in coming at all. They come to learn, sometimes to learn that they need to change their approach or to work on the new skills which the Pos’tiv people gave them. Surely, it is true that anyone who will take a day out from their busy life for training in vegetable inspection is being brutally honest with himself in admitting that he has much to learn. Indeed, every person who has come on these tours has found it valuable. But, the people who are most impressive are the mashgichim. Very impressive! If he comes, he’ll earn no money for that day, even though he is working exclusively for one hashgacha which will directly benefit from his training. We also see that the kashrus agency who expects him to check vegetables has no regular educational program. But, imagine, he is willing to lose a day’s pay just to learn and to improve his performance. Is he not someone to look up to? “At our training here at Pos’tiv, I am always careful to mention among the very first concepts, the very fundamentals of an expert mashgiach, is ‘PATIENCE’. Everybody is surprised: patience before “eagle eyes”! It doesn’t seem the right order, but it is. With the best eyes in the world, if you are jumpy and ready to move on to another spot on the cloth, then you will miss insects. Personality is more important that raw ability. I have seen it time and time again. One of the issues most discussed in kashrus today is whether such efforts to spot insects are so critical. While no one would ever knowingly eat an insect no matter how small, when it come to checking for them, quite a few Jews have different ideas. It is unquestionable that sometimes, in some of what we eat, an insect may be present. Still, when we have done our due diligence by properly inspecting vegetables before eating them, does it really matter if we got out every single insect? This is the way some think. Are they right. Let us hear it straight from Pos’tiv’s head mashgiach. “I often ask at my lectures whether it is required of me to hire ‘expert’ mashgichim to check lettuce. By ‘expert’ I mean people who have been working in the field and who possess exceptionally good eyesight. Let me make this 100% clear, once and for all, as the Darkei Teshuvah says (84:15). “I’d like to add that we have here a potential prohibition that includes 5-7 different negative commandments per insect, a frightening prospect. With all that at stake, who wants to take chances. The time has come to review your position vis-à-vis New York State Kosher Law Enforcement. We need you to allocate funds to put at least some of the former inspectors back on the job of ensuring that the citizens of this great state are properly protected from fraudulent claims of kosher. Why are we asking you to do this now? In the last eight months since you started serving your term, the following facts have come to light. 1. In the first 6 months since state safety inspectors were charged with “also” monitoring kosher disclosure, there were less than 5% of the inspections of the previous year. 2. This summer Federal Judge Nina Gershon issued a decision that New York’s kosher law is constitutional. The constant fear the state had that the constitutionality of New York’s law may be proven unconstitutional inhibited both the department and the Attorney General. No fines for kosher were issued in over 3 years. All of this tended to make Kosher Law Enforcement an albatross of the state. All that has now changed. Contrary to what the populace thinks, economics was not the reason why the former governor decided to completely dismantle Kosher Law Enforcement rather than to reduce it in kind with other reductions the state needed to make. It was the Commack challenge of the law. Now we can go on. The men can return to their jobs and the state can offer those who choose to buy kosher the confidence that New York will help protect them from fraud. At this very moment a legal case has been filed by the union to which the former New York State Kosher Law Enforcement personnel belonged challenging their dismissal on religious grounds. If they win, it will be a huge embarrassment for the state and may lead to a thorough investigation of the entire affair. The Kosher Law Enforcement Bureau served the state admirably for decades. The fine work of Rabbi Shulem Rubin and his successor, Rabbi Luzer Weiss, has always brought credit and money in fines issued. Bring back the staff to Kosher Law Enforcement and everyone in this state will reap the benefits of their dedicated work. 1. Tenderchick chickens (a product of South Africa), certified by the Beth Din South Africa, bear Pesach clips attached to their wings. These chickens have just been produced, but due to supplier shortages these clips were used. These chickens are not Kosher for Passover. 2. Shechitas Bais Yosef was written in Hebrew letters on pork and other non-kosher meats being sold at the Associated Supermarket in Sunnyside, NY. The store explained that this was a mistake because of use of a second hand labeling machine which had been used by a kosher store. 3. All Miss Leone's Products, including Mozzarella Cheese Stuffed Olives (Leonard Mountain Inc. - Bixbi, OK) bear an unauthorized “OU”. Miss Leone's products are not certified by the Orthodox Union, some have an unauthorized “OU” symbol and contain non kosher ingredients. Corrective measures are being implemented. 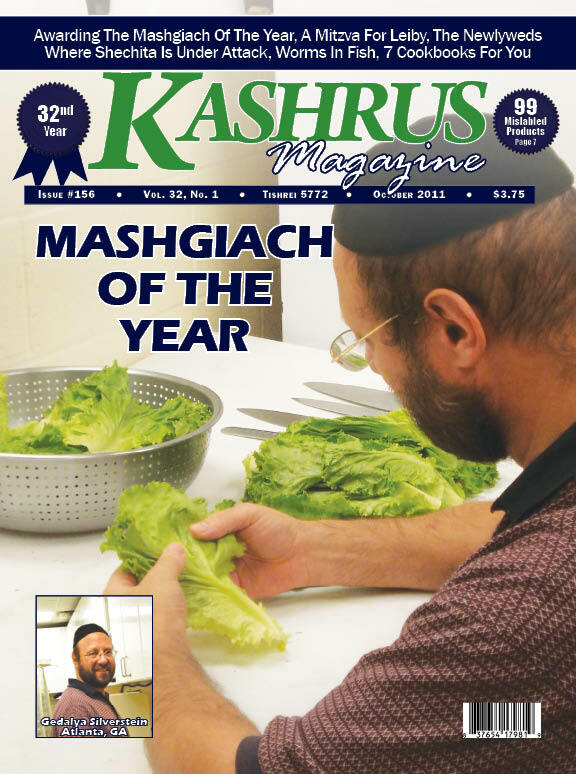 For many more consumer alerts, subscribe now to KASHRUS Magazine.